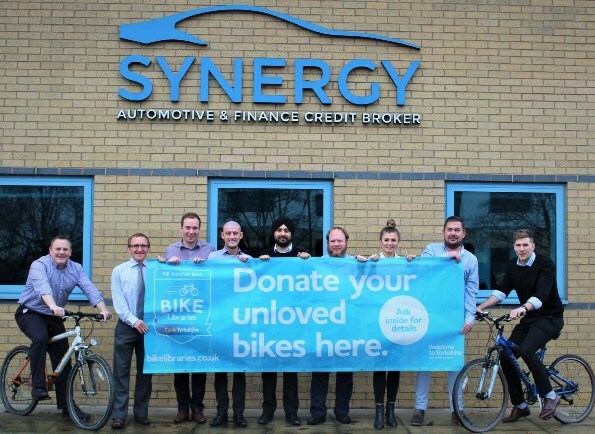 Synergy Automotive is gearing up to smash ambitious targets in its continuing community role as a Yorkshire Bank Bike Libraries donation station. During the first quarter of 2019, the Yorkshire based vehicle leasing, contract hire and rental provider, Synergy, is aiming to collect 150 unwanted or unused bikes for children and their families, who otherwise wouldn’t have access, to a borrow and ride a bike for free. Synergy welcomes adult and children’s bikes at its Harrogate headquarters at Hornbeam Park and can also collect cycles from businesses and individuals in North Yorkshire towns including Harrogate, Skipton, Ripon, Ilkley and Boroughbridge, who are unable to drop them off. A champion of giving back to its local communities, Synergy’s bike donation drive follows a highly successful campaign in 2018 which saw companies and the local community deliver almost 100 bicycles to its offices. Sir Gary Verity DL, chief executive of Welcome to Yorkshire, said: “Our Bike Libraries programme helps to turn dreams into a reality by providing opportunities to borrow and ride bikes for free, so I’m delighted to see Synergy continuing its ambitious campaign – they’re going from strength to strength and becoming an invaluable resource to the local community. Synergy welcomes bikes, including those in need of repair, from 7.00am – 9.00pm on weekdays starting Monday, January 7 to Friday, March 1 at 12A Hornbeam Park Oval, Hornbeam Park, Harrogate. For more information visit https://www.synergyautomotive.co.uk/blog/we-wheelie-want-your-bikes/ or call 01423 228280.